It’s easy to fall into the habit of eating the same thing for breakfast every day, but why not kick off your weekend with something new? This delicious and nutritious twist on breakfast porridge is the perfect way to start your day! Amaranth is a super grain that’s packed with high biological value protein, vitamins, minerals and fiber, and, to top it all off, its unique nutty flavor is also delightful! Place amaranth and water in a pot and bring to a boil. Leaving the lid partially on, reduce the heat to a simmer and cook for 25 to 30 minutes, stirring occasionally. Once all of the water has been incorporated, gradually add in the soy milk, until the desired consistency is reached. Your finished porridge will be slightly gelatinous. To serve, pour into a bowl, top with your favorite porridge toppings, and enjoy! Sweet! Chopped pears, pecans, cinnamon and honey. Greek yogurt, fresh fruit, and chopped nuts. 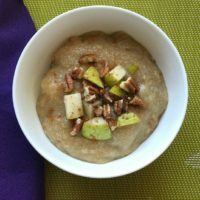 For a fall twist, top with a few tablespoon of pumpkin puree (look for unsweetened), honey or maple syrup, cinnamon and walnuts. Make it savory! Add a fried egg, fresh chives and black pepper. Check out this tasty amaranth cornbread!